Water Polo legends: 1901: The team of “Tyldesley” S.C. The Water Polo team of "Tyldesley Swimming Club", England in 1901. The players: Addin Tyldesley, Nathan Potter, H. Omerod, Alf Tyldesley, Frank Isherwood, Jack Dale, Frank Tyldesley, William Platt, T. Matthews, M Berry. The first Water Polo success was in 1900, when Tyldesley won the Manchester and District Second Division Championship. 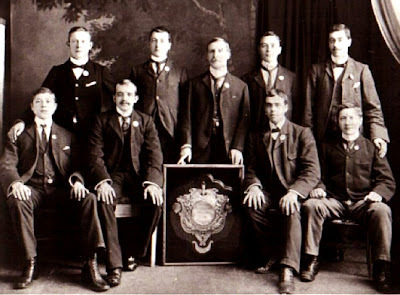 “Tyldesley Swimming Club” won the Northern Counties Flying Squadron Championship in 1901 and 1903.